Recently J.T. Ross swept the board with top honours for its overhaul of the Lion Match factory at the South African Property Owners' Association awards in Gauteng. J.T. Ross has built its national headquarters in the redeveloped Lion Match Office Park on Umgeni Road, Durban. through innovation and excellence in the property development sector. Lion Match Office Park, with tenants ranging from a medical centre, a dentist, a beauty salon to conference facilities and home to the Durban Chamber of Commerce and Industry among others, has created a community of its own. It has also added to the social upliftment of the adjacent Station Drive. J .T. Ross's development director, Grant Smith said,"The thing about Lion Match is that it is a landmark of significance. The Lion Match factory premises have a long history, having been built initially for Hunt, Leuchars and Hepburn, whose substantial timber holdings provided the wood for the matches. The factory itself is gone, but the new clean-looking office park designed by Dean Jay Architects is attracting major tenants with virtually no promotion." "The market has jumped at it," says Smith. "We have kept all the main ingredients of the past building and the Monuments Commission is comfortable with where we are going. The development is exciting, challenging and rewarding. This is known in the trade as red-brick re-generation, embodying modern collaborativeness with an historical edginess. We are proud of the brands we have attracted here. The office park is situated just outside the city centre but the nearby iconic Moses Mabhida Stadium and sports precinct has provided an incubator for success." J.T. Ross (Pty) Ltd is a family company established in 1902. In 1898 James Taylor Ross started a small business as a journeyman joiner. In 1919 he was joined by his son John Douglas Ross, and together they built a sound business with its roots in construction and civils. John's son John Garth Ross then joined the family business, which is today under the leadership of Douglas Garth Ross, continuing a proud tradition over four generations. J.T. Ross provides a comprehensive range of leading and specialised property solutions still essentially Durban based, but with a growing national and international footprint. The business has evolved into a property investment and development company with significant investments in commercial and industrial property in South Africa and the United Kingdom. An innovative, award-winning team shapes its business, underpinned by quality, integrity and reliability. J.T. Ross offers a 360-degree property development solution with an experienced team, including specialist services in: concept planning, site investigations, feasibility studies, design, local authority liaison, time planning, construction management, cost control and reporting.  The Rydall Views building at Rydall Vale Office Park on La Lucia Ridge is the first building in the J.T. Ross property portfolio to be awarded a Green Star Rating by the Green Building Council of South Africa (GBCSA).  J.T. 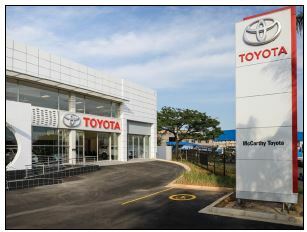 Ross's new investment - the R30 million stateof-the-art Toyota dealership on the corner of Solomon Mahlangu (formerly Edwin Swales) Drive and Jaco Place - fully encapsulates a whole new concept. Grant Smith, said that the custom built and highly specialised facility was likely to be the first of many similar developments for the company. Tshelimnyama safe passage over the road to the nearby Westmead Industrial township. Construction included a walkway which extends from the bridge through to Chesterville, Westville and the Pavilion Shopping Centre transport routes. The initiative was undertaken by The South African National Roads Agency. Ross Healthcare is a division of J.T. Ross, and specialises in facilitating the development and management of private healthcare facilities which includes Hillcrest Private Hospital as well as the Gateway Private Hospital. With development, commissioning and management service packages, Ross Healthcare is able to assist their partners through all stages of establishing their healthcare facilities. Rossmin, a subsidiary company of the J.T. Ross Group together with KZN BEE shareholding, is involved in the mining of a high quality limestone deposit near Port Shepstone and the processing of this into various agricultural and industrial products. All the necessary mining and environmental permits have been obtained and the mine is currently in the process of being established. Smith concluded, "We develop properties for investment. What differentiates us is that we usually retain majority ownership. So the developments are actively managed by us from within the organisation. We can't run away from any construction problems, and we try to invest and build sensibly for the long term."